As with all of the modeling projects I've taken on over the years, the Batmobile conversion chronicled in this tutorial was started with the best of intentions. With the 2011 release of an accurate 1/25 scale Batmobile kit by Round2/Polar Lights, however, this conversion project has been stopped as has the writing of this tutorial. It's a known fact to most modelers that the amount of work that goes into scratch-building a model of a subject not available as a kit is directly proportional to the likelihood that a kit manufacturer will soon release a full kit of that very subject and in the same scale. (There must be an equation for that!) Round2/Polar Lights was kind enough to announce their plans to produce their Batmobile kit long before I had reached any Point of No Return in this conversion. And, yes, I did purchase the Polar Lights kit. This unfinished modeling project and tutorial is dedicated to all of my fellow modelers who have ever busted their butts converting or scratch-building a particular subject because no kit was available only to see that subject be released in kit form after doing all that work. The need or desire to superdetail every model, often at the expense of completing any. I grew up in the 1960s and was fed, from early on, a steady diet of television. 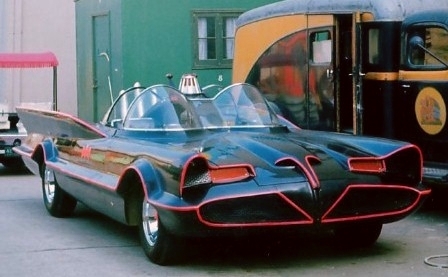 As a result, I'm convinced that the Batmobile from the 1966 TV show Batman is probably . . . no, definitely the coolest car ever to be designed and built. This work of Car Customization Art is still impressive years after it was created and is considered by many Bat-fans to be a better looking Batmobile than any later form of Bat-Transport. As a scale modeler and former 11-year-old who loved the show, I always wanted to build a good replica of the car George Barris customized from a 1955 Lincoln Futura show car. In the late 1960s, Aurora released their Batmobile kit which had a limited production run. At 1/32 scale it was small, lacking in detail and had some accuracy issues. Like other kids, I couldn't wait to get my hands on one. I got Aurora's kit as part of a Chips Ahoy! mail-away promotion and put my heart and soul into building and painting that model. The paint was heavily slopped on by hand and I didn't quite get the colors right. (My sole knowledge of the look of the car was from watching Batman on a 17 inch black & white TV.) Still, I was busting with pride over it. That was until the Fourth of July fireworks season a few years later when I learned that the Batmobile couldn't fly but Batman could if you placed a firecracker in just the right spot. The Batmobile kit wasn't in hobby shops long before Aurora ceased production. No other major kit was ever produced. If a modeler wanted to build a Batmobile, there was a hard to find Japanese kit available in the 1980s which looked more like a toy than Aurora's little kit did. By the 1990s, there were polyurethane resin "Garage Kits" being sold which had names like the "Batura" and the "Batcar" but these kits were crude, required advanced modeling skills and were pretty expensive. In the late 1990s, Revell re-issued its 1956-vintage 1/25 scale kit of the Lincoln Futura, the concept car that George Barris customized to become the Batmobile of the TV series. 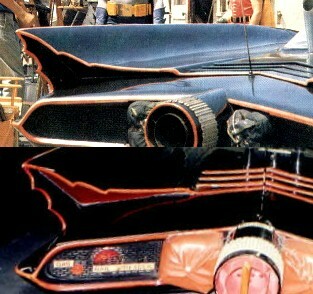 The kit was bought by many for the purpose of converting it to the Batmobile as Barris did to the real thing. This would also be a job for an advanced modeler with the time and the drive to do some work that may be more of a challenge than the typical modeler might be willing to take on. I wanted to take on that challenge. At least my intentions were good. All I needed was the motivation. That motivation was, to be kind, elusive. Having been an avid modeler suffering from AMS (Advanced Modeler's Syndrome), I already had several large, labor-intensive, long-term modeling projects in the works and I just wasn't up to taking on another one. The Futura kit sat on the shelf. 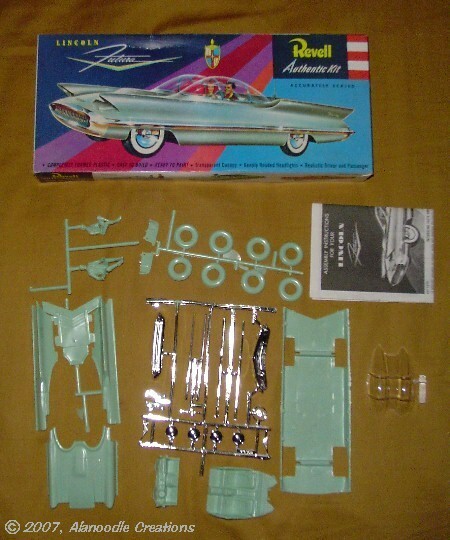 Revell's Lincoln Futura is a simple kit featuring an interior and exterior, no engine or trunk. Construction is strange for a car kit. Instead of the body being a single piece that's placed onto a chassis, the body has 4 separate pieces that make up what is actually the upper portion of the body. This then fits on top of the chassis "pan" which also includes the bottom-half of the body with a strip of chrome covering the seam going from front to back. In 1999, Skyhook Models, a manufacturer of polyurethane resin garage kits released a conversion kit designed to turn the Futura into the Batmobile. The kit is a collection of replacement parts designed to fit perfectly with Revell's Futura parts, eliminating the need for a lot of scratch-building. I was familiar with the quality of Skyhook's kits, having built their Futurama Spaceship and their Earth vs the Flying Saucers mini-diorama. I ordered the conversion kit direct from Skyhook without hesitation. Skyhook's kit was not a disappointment. 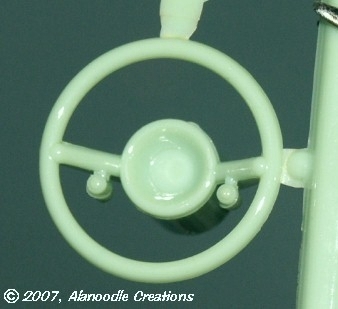 The parts are beautifully cast with no visible pinholes. Some cleanup would be necessary but the kit, without a doubt makes the job of building the Batmobile much easier than it would be otherwise. 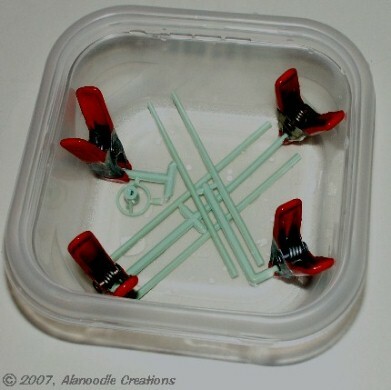 The resin parts fit the molded plastic parts of the Revell kit perfectly. The Skyhook kit does not include tires or wheels. The tires and hubcaps in the Futura kit are a far cry from the Batmobile's chrome mag wheels with bat-spinners. Looking for accuracy, it was important that I build the Batmobile with the correct hardware. During most of the show's run, the car had blackwall Firestone tires on "Single Rib I" wheels by Radir. No aftermarket sets exist of the Radir wheels. I did find a car kit that would provide them. AMT-Ertl's Fireball 500, which depicts another car customized by George Barris, includes a good representation of the mags. 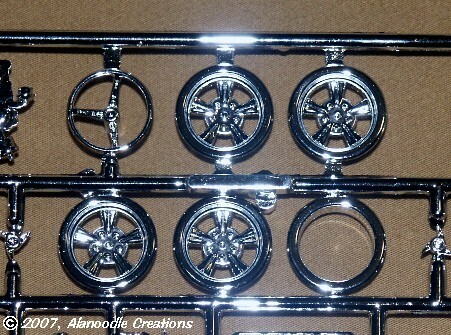 The photo at left shows the kit's wheels on the sprues. Tires were another issue. The Fireball 500 came with whitewall tires that are clearly marked with the Goodyear logo on both sides. I found blackwall "Firestone Style" tires from Plastic Performance Products, a maker of aftermarket model car accessories. For the Bat Spinners on the wheels, I found photo-etched brass "Bat Hubs" made by Millennia Models International of Canada. These tiny things are beautifully detailed. I decided to begin the conversion by modifying the fins on the Futura to become the car's trademark Bat-Fins. 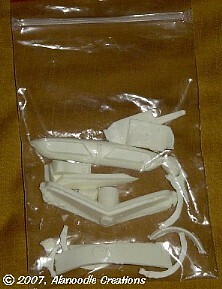 I was surprised that Skyhook neglected to include modified fins in their conversion kit. 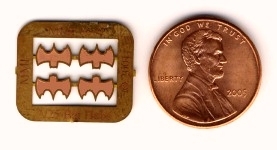 From available photos, it appears that material was added to the existing fins to create the Bat-Scallops. Adding material to the Futura kit's fins would be a bit more complicated than just taking a file to them. 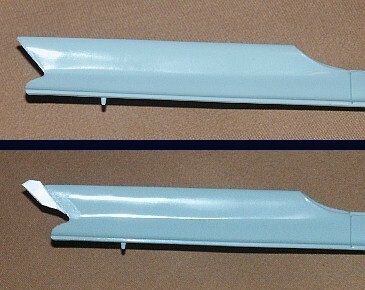 The Revell kit's fins were molded with ribs for gluing the Futura's tail lights (left). On the actual car, the tail light housings were removed from the fins while the show was being filmed. The tail-lights were installed back onto the car years after the show was canceled, probably to make it "street legal" for car shows and "live" appearances - left, bottom. Since I wanted to model the original Batmobile (also known as "Batmobile #1") as it appeared on the show, I decided to remove those ribs with an X-Acto chisel blade and leave the tail lights out. The sequence of images below shows the addition of .040" thick sheet styrene to the fins. The plan was to cut out the Bat-shape first with a rotary tool and then with Bat-tail files. This is as far as I got. Few of the Futura's chrome parts were needed. The ones I would use, the steering wheel and the side trim, needed the chrome stripped off. Having never stripped chrome plating off of plastic model parts before, a little research was done. 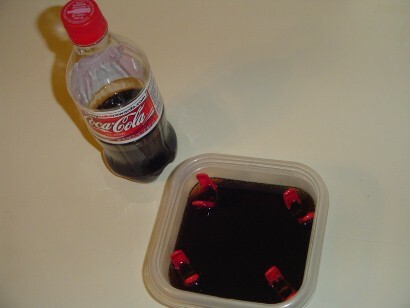 One online article I found recommended Coca-Cola to remove the chrome. After soaking the parts overnight, all it did was give the chrome plating a very strange, unpleasant smell without removing anything. Eventually I found a method that was supposed to be both environmentally friendly and was guaranteed not to stink up the house. 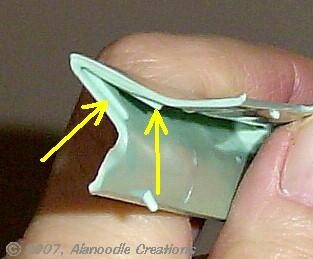 Don Schmitz has a "How-To" and Tips page on the Ninfinger.org website detailing, among other things, how to remove chrome with a variety of household chemicals. I selected Formula 409 because I had a bottle under the sink and it doesn't create nasty fumes like oven cleaner, bleach or brake fluid. 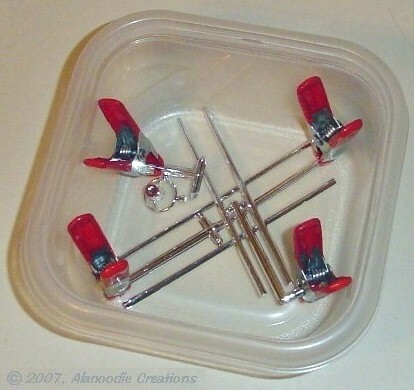 The parts were placed in a plastic container. Spring clamps were clipped to the parts to weigh them down and keep them from floating. 409 was then poured over the parts, just enough to cover. About a half-hour later, the chrome was gone. No scrubbing was needed - the chrome plating just dissolved off of the styrene. All that showed was the bare plastic in the same pale turquoise as the rest of the Futura kit. An overnight soaking in water removed any Formula 409 that might still be on the plastic. The photo to the right is a close-up of the steering wheel after the soak. 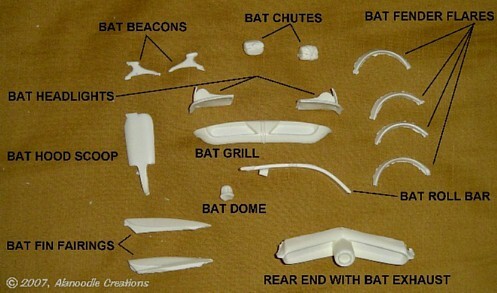 In 2011, Round2/Polar Lights announced plans to release an injected molded, 1/25 scale kit of the '66 Batmobile. George Barris gave them access to the original #1 Batmobile to insure that an accurate kit was produced. Work on this conversion stopped. I did purchase the Polar Lights kit and the work on that is not going much faster than it would be if this was another scratch-building project. Progress on that can be seen here. Some of the items acquired for the conversion have been put up for sale on Doctor Noodle's Basement. Who knows? 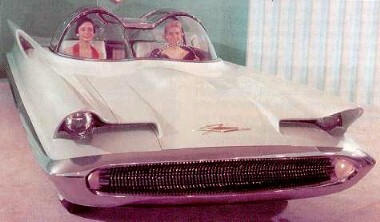 Maybe I'll even get around to building the Lincoln Futura. Advanced Modeler Syndrome affects modelers worldwide. Won't you help? Please give generously to the Alanoodle Wants To Buy More Plastic fund. We accept cash, Paypal and anything that contains toluene or methylene chloride.